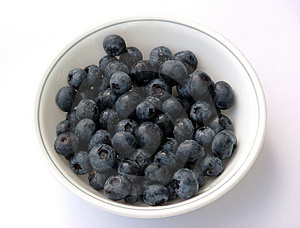 Do blueberries cut your risk of type 2 diabetes? Fruits and fruit juices have long been associated with healthier living. ‘An apple a day keeps the doctor away’ is a classic refrain, and it is true that the vitamins and fibre in fruits are beneficial to humans, and have been shown to reduce the risk of contracting some chronic diseases. However, the evidence surrounding fruit’s ability to reduce the risk of type 2 diabetes is not particularly clear. The researchers note that previous studies may not agree with each other because of differences in the groups of people asked to take part, not to mention the nutritional properties of the different fruits used. (they also asked some follow-up questions about watermelon, for reasons that are not made clear in the paper). These fruits were chosen because they span a range of different values of glycemic index (or GI), which measures how quickly blood sugar levels rise after consumption. High GI foods have been linked with obesity, and a low GI diet has been shown to reduce type 2 diabetes risk. The authors found that respondents who ate more blueberries, grapes, apples, bananas and grapefruit were less likely to develop type 2 diabetes. Surprisingly, the GI of these fruits is not linked to diabetes risk: grapefruit is a low GI fruit, but bananas and apples are high GI fruits! Also, drinking too much fruit juice increases your risk of type 2 diabetes, as juice can affect your blood sugar levels much more rapidly than fruit. In fact, the researchers find that substituting juice for whole fruit also reduces your diabetes risk. The authors note that one of the main weaknesses of the study is the reliability of respondents to the questionnaires. Everyone knows that you should eat fruit, and there is a possibility that respondents inflated their fruit consumption to meet society’s standards, so the amount by which risk is reduced might change depending on the cultural norms of the participants in the study. Also, despite the large sample size, the study is strongly biased towards participants who have European ancestry, and the sample is not well balanced in terms of gender (the sample is around 80% female). ITV news briefly mention the story here, but also publish comments from Dr Matthew Hobbs, head of research for Diabetes UK, who warns about the study’s ability to discern between individual fruits given the potential for recall bias, i.e. humans can be biased towards remembering certain things more than others, and this can affect which fruits respondents note in their questionnaires. Sadly, they do not post a link to the original paper. The Mirror goes into the detailed figures by which individual fruits cut risk, and adds a quote given to the British medical journal from a Harvard team. It’s not clear from this attribution whether they mean the original research team, or another team offering their comment on the work. Again, no link to the paper. The Huffington Post reported the story in more detail, listing the risks of each fruit explicitly, and mentioning where the paper is published (again, no explicit link). They quote at length from an interview with Dr Hobbs about limitations of the study, giving him the chance to detail his dietary advice to prevent diabetes. The media are quite keen to quote percentage reductions in risk from such studies, but Dr Hobbs is right to be cautious about making statements like this. After all, quoting numbers like these without error bars or some estimate of how uncertain you are about them can be dangerous, especially as there are potential biases lurking in the data, which the authors themselves want to investigate further. « Bracelets and Arthritis – Decoration or Cure?